Flaxman Estates Marbella - Buy your dream home today. Meet Julie and Neil Flaxman, a wife and husband team dedicated to fulfilling your property dream. With property experience dating back to 2004, we have provided and continue to provide an honest and trustworthy service. At Flaxman Estates, we are in your corner, doing the right thing for you and matching you to your perfect property. We listen and understand your dreams; taking into account your lifestyle and desires and not stopping until the perfect property has been found. The personal touch with Flaxman Estates. Many thanks This testimonial does not fully capture all of the many fine attributes and services that Flaxman Estates do provide and carry out for any prospective buyer. To find out what they offer, then register with them, we guarantee that you will not be disappointed. We previously were on the mailing list and inspected properties with other agents to no avail. 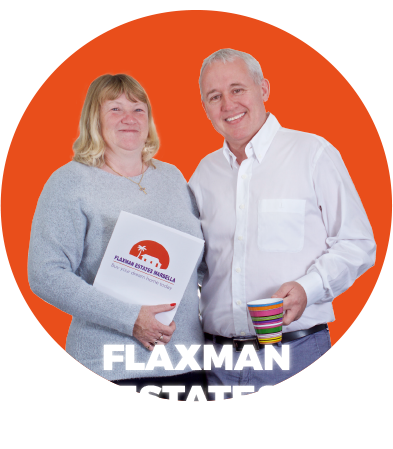 My wife found Flaxman Estates and what a find, from the outset and the initial inquiry, we knew we would be happy with them. David & Catherine Morrin & Family. Many thanks We have used Flaxman Estates on a number of occasions over the past few years to both buy and sell our properties in Spain. Julie and her team offer a professional and knowledgeable service. Her advice is sound and she offers a very matter of fact no nonsense approach which is invaluable when buying abroad. It is too easy to be sucked into viewing numerous properties with rose tinted glasses changing your goal posts and leading you into the possibility of making a huge and expensive mistake. Many thanks My girlfriend & i have recently purchased a beautiful apartment in Torrequebrada with Golf & Sea views with the help of Julie & Neil of Flaxman Estaes Marbella. Whilst we were was bombarded with many other agents wanting to show us around we felt Julie's knowledge & expertise of the property market was second to none & was very much appreciated. A big Thank You to Julie Flaxman Because of family reasons I had to sell my lovely apartment in Elviria. After having tried with different Estate Agents to find the right buyer it was Julie Flaxman who appeared some weeks ago with a nice Norwegian couple who fall in love with my apartment and decided immediately to buy. Happy vendors When my husband and I decided to sell our villa in Southern Spain it was a dilemma as to what estate agent to use as we didn’t live there full time we were concerned as to who we could entrust with the keys to the villa. Very pleased new owners To whoever may read this and be thinking about who to use when buying in Spain. What can we say about Flaxman Estates Marbella? Julie and her team made the process so easy and understandable from our initial enquiry to picking up the keys for our beautiful new apartment in the Marbella hills. Fantastic service We went to the Costa del Sol in July for a week to decide on a location to buy a holiday flat. We chose to use Flaxman Estates Marbella as my husband had been browsing their website whilst in the UK and they had a good selection of properties to view. By the end of the week we had not only found the location but also the right flat and we had our offer accepted. Julie really did make this buying experience a pleasure I always thought that buying your first house in the UK would be one of the most stressful things ever so buying one in Spain would be out of the question ..we had looked at about 3 properties on the internet around the costa del sol and really wanted to view them. Happy vender To try and sell a property is always a daunting task but more so in an unfamiliar area or country. Let me tell you about our experience. There are a limitless number of agents offering to help and promising a quick sale, some even encouraging a higher selling price than originally thought. To place the sale with one agent with exclusive rights is not recommended but to sign up with more than 1/2 agents is demotivating and confusing, for you and for them. Happy owner Being the happy owner of a nice Penthouse apartment in Elviria Hills for many years, I considered buying a house in Nueva Andalucia and did talk to some Estate people ( Julie flaxman was one of them ) to help me find the right one, view to La Concha and overlooking the Valley and the sea. I almost had given up until Julie one day rang me, to tell me that she finally had found the right one, so very quickly we got this fantastic spot in our hands. Many thanks Julie I just wanted to thank you for all you have done for us when buying our first property in Spain .We were so nervous about buying a property abroad as you know but thanks to you it was extremely easy and stress free .It is very clear that you love your work and you go above and beyond what anyone could expect an estate agent to do. Testamonial Having thought about a holiday home in Spain for several years we had spent a lot of time browsing properties on the Internet. We felt that the Costa del Sol would provide the best weather and Malaga seemed to have plenty of flight options from Scotland. We sent a few Internet enquiries without realising that each estate agent can access all properties. Big thanks As someone who usually shies away from writing reviews I felt it very important to share our positive experience with Flaxman Estates. Having searched for our ideal location and property for many years to no avail we were finally introduced to Julie and our search was soon complete. Impeccable service Dear Julie I am not one pf those serial reviewers who feel compelled to scribe all over any and every website based on experiences they have had snd certain this is my first ever contribution, however due to the service i have recently received from yourself and Neil and its exceptional standard i for once had to share my views more formally. Testimonial One of the first things you worry about when looking to buy a property abroad is what agent to use. If you get a good agent they will steer you in the right direction with regard to the whole process which will inevitably differ from whatever you are used to. They will also help with solicitors, banks, and even mortgages, but only if you get a good agent who recommends good people. Testimonial What a pleasant surprise! When my husband enquired about an appartment Julie came back to him with not just 1 flat but 5 viewings. All perfectly organized. We quickly made our mind up which one to choose. And here the big suprise. Julie's sevices didn't stop at that point. She found us a lawyer, helped with the paperwork, went with us to the "Notario" and gave us all the encouragement we needed when the seller didn't get their act together. We found exactly what we had been looking for After lots of research both in Spain and in the UK I found Flaxman Estates on the internet after my first telephone call with Julie Flaxman I was put at ease at last I had found someone who understood my needs and what I was looking for. My requirements were very specific and Julie homed in on this and provided me with properties to view within our prize range and specifications. Many thanks JulieI was searching the Costa del Sol for a year with the view to buying an apartment. I had been in contact with a couple of estate agents who had taken me to view a lot of properties, off which many did not suit my requirements. A well-earned massive thank you to Flaxman Estates Marbella. A well-earned massive thank you to Flaxman Estates Marbella. I had been looking for a property on the Costa del Sol for about 18 months and had tried several estate agents. Whilst I gave them a list of criteria that I wanted in a property, it never seemed to work out! They showed me lots of apartments but very few were what I had asked them to find for me.